It’s probably not just a coincidence that the first recipient of MusiCares’ Person of the Year honor since the Recording Academy created a task force on diversity and inclusion earlier this year is a woman. Being a woman probably wasn’t a requirement, but in the era of #MeToo, it was most likely a huge plus factor. It goes without saying that Dolly Parton is fully deserving of the award. The legendary artist and songwriter is by no means a token. She has won eight Grammys and received a Lifetime Achievement Award in 2011. But choosing her helps bring a little more balance to the MusiCares honor roll: When Parton picks up the award on 2/8, she’ll become the first solo woman to be so honored in five years—since Carole King in 2014. Moreover, she’ll become only the seventh solo woman to take the honor since it was first given in 1991; the others are Bonnie Raitt, Natalie Cole, Gloria Estefan, Aretha Franklin and Barbra Streisand. In that time, exactly three times as many solo men (21) have received the award. This past year, for the first time, the winner was a group, the co-ed Fleetwood Mac. The Grammys have yet to announce the host of the 61st annual Grammy Awards, set for 2/10 at Staples Center. Men have hosted the show the last seven years—with LL Cool J handling the job for five years, followed by James Corden for two. No woman has hosted the telecast since Queen Latifah in 2005. And just three other women have ever hosted—Whoopi Goldberg (1992), Ellen DeGeneres (1996-97) and Rosie O’Donnell (1999-2000). But the biggest and most consequential choice the Academy will be making is who will succeed Neil Portnow as President/CEO. Men will have held that job for 31 straight years—since Mike Greene assumed it in 1988. (At the outset, his title was National President. The CEO title was added in 1992.) Greene held the job for 14 years. Portnow will have held it for 17 years by the time he hands the baton to the next chief. 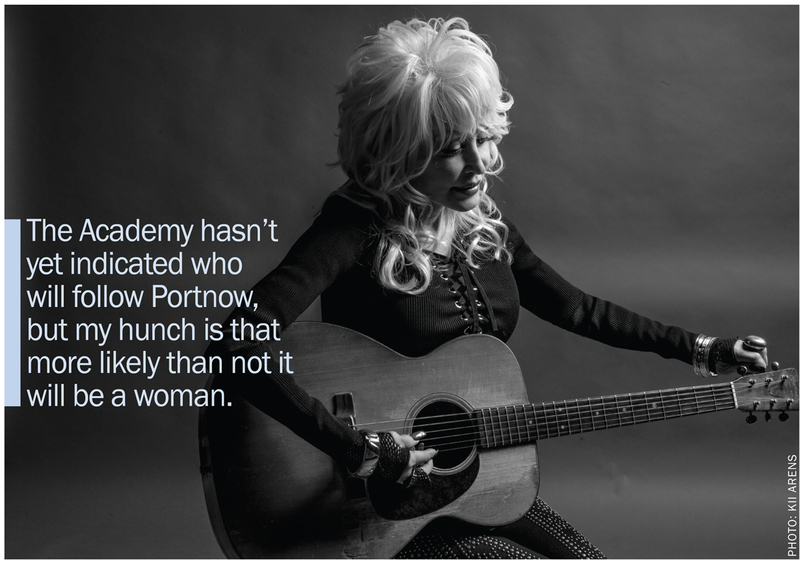 The Academy hasn’t yet indicated who will follow Portnow, but my hunch is that more likely than not it will be a woman. No woman has headed the academy since Christine Farnon served as Executive Director from soon after the Academy’s founding in 1957 until Greene took over. Farnon remained with the Academy as Executive Vice President until 1992, when she retired. Could women possibly fill all three of these high-profile slots? We’ll soon see.